KCAC�s emphasis on bringing marginalized perspectives to the forefront has helped me revise my approach to teaching imperialism.� This lesson seeks to involve a diverse student population in an intellectual and effective way with the incredibly rich and complex forces that led to the imperialism of the nineteenth century. Drawing upon KCAC�s core principle that writing generates cultural understanding, the students will research and write to reflect and shape their knowledge of history. 2. Read My Place.� Teachers must read the book ahead of time, as it is a very complex and rich book. 3. Discuss the process of My Place and the concept of a geographic place as it relates to different times and events. 4. Divide the class into groups of four or five students.� I prefer to pick the groups to widen the circle of students involved. 5. 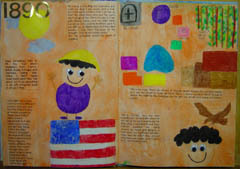 Students are to create their own My Place book.� The students must use the style of the book to relate the history of their assigned country -- China or Japan �- from the perspective of children over time.� While the information is presented from the point of view of a young child narrator, the text must be based on historical research conducted by the students.� One student challenge is to craft that research into the voice and the imagery of their young child narrators.� Maps and colorful pictures emulating the style of My Place are strongly encouraged. 6. Students are given three class periods of one and one-half hours each to complete this project. Evaluation:� Grades are based on adherence to the style of the original text, maps and pictures produced, and accuracy of the historical writing. The following are sample pages from the book written and illustrated by sophomores Rachel, Caroline, Bridget, Danielle, and Meara. This is an excellent activity for teaching imperialism.� It does require time and effort by both teacher and student. Any World History course is constrained by time and curriculum demands, and this project takes many hours. In particular, assisting the students� retrieval of research materials requires a commitment from the teacher. As students build specific examples of events, people, and material structures that are involved in the place they study, they gain a sophisticated sense of how elements in a physical space can stay the same as the culture around it changes substantially. We, as teachers, want students to feel, as well as to understand, the motives of people long ago.� This activity goes a long way in accomplishing that mission, as students learn to identify with people from another time and place. They benefit from putting themselves in �other people�s shoes,� a task which is always difficult but rewarding. Few of us have the opportunity to recognize our place in history. This project goes a long way to building understanding of how historical forces can affect the daily lives and physical spaces of people who live there. One outgrowth of this project for my students has been an increased emphasis on team-building. Another specific benefit of this project is opening up the perspective of the colonized, something which is especially challenging for students in America today. This goal is important to address because, in a world that is increasingly shrinking, we need to think even harder than in the past about motivations, cultural contexts, and the place of history in daily life. 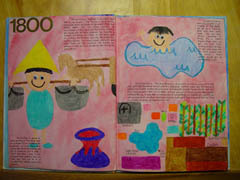 -- Elementary education majors might read this book and craft their own as an example for their future classrooms. -- Emphasize collaborative learning by assigning different tasks in the assembly of the book�e.g., researching the history of place, collecting images, creating text, and editing both image and text. -- This picture book employs rudimentary maps of the narrator�s place.� Students of any age could be asked to create a map of their area.� These maps would be useful, when examined collectively, in analyzing not only the students� views of their region, but to uncover patterns of understanding their region.� Do they draw the road or transportation systems, or do they focus on a particular landmark or city block? -- Students from Boston, Massachusetts, to Ojai, California, could model a project on the book My Place.� Exploring their city block or country setting is a worthwhile activity and could easily be adapted to any venue. -- Why not �The Music of My Place� or �The Inventions of My Place� or �The Films of My Place�?� Ask students to locate newspaper articles from local or regional papers and create a �newsbook� that historically situates artistic or scientific endeavors.